Britain and India pressed Pakistan on Thursday to tackle militant groups operating from its soil as British Prime Minister David Cameron wrapped up a two-day, trade-driven visit to the country. Cameron's trip, seen as test of his much-hyped business-oriented foreign policy, was engulfed from the start by the issue of extremism in South Asia after remarks he made about the "export of terror" from India's neighbour. His initial aim -- revitalising a bilateral relationship he thought had stagnated -- did win support from his Indian counterpart Manmohan Singh, however, who said the visit had injected "new momentum" in their partnership. They agreed to try to double trade in five years and signed several relatively minor exchange agreements, but militancy in Pakistan, blamed for attacks in India and Afghanistan, dominated their final press appearance. "No one is in any doubt, least of all the Pakistani government themselves, that there has been and still are terrorist organisations ... that need to be cracked down on and eliminated," Cameron said. This was echoed by Singh, who again called on Pakistan to "honour its commitment given to us on a number of occasions that Pakistani territory will not be allowed to be used for terrorism." Pakistan has been under intense scrutiny this week after leaked secret US military documents detailed alleged links between Pakistan's ISI intelligence services and Taliban insurgents in Afghanistan. Pakistan-based Lashkar-e-Taiba (LeT) is also held responsible for the 2008 Mumbai attacks, which left 166 people dead and derailed a slow-moving peace process between India and Pakistan, which have fought three wars since 1947. British Prime Minister David Cameron (L) and Indian Prime Minister Manmohan Singh arrive for a meeting prior to delegation level talks and agreement signing in New Delhi. Next week, newly-elected Cameron will host Pakistani President Asif Ali Zardari, with the relationship likely to have been strained by his sharp criticism of support for insurgents in Pakistan. Asked about unrest in South Asia on Wednesday, Cameron responded that Pakistan could not be permitted to "look both ways" in promoting the export of terror while publicly supporting stability in the region. Pakistan's ambassador to Britain accused Cameron of "damaging the prospects of regional peace," while the foreign ministry in Islamabad reminded him of the nation's commitment and sacrifices in the fight against terror. "I believe in speaking clearly and plainly about these matters," Cameron told the news conference. "What we will continue to do is to work with the Pakistani government to do everything we can to encourage them to crack down and take on these groups that have caused so much pain, so much suffering within Pakistan and outside." Cameron, despite the time spent discussing Pakistan, had been keen to focus on how to deepen bilateral economic ties with India, the former jewel in Britain's colonial crown and now one of the world's fastest growing economies. He praised the recent investment in Britain made by Indian-run companies such as the car maker Tata and steel group Arcelor Mittal, but also pushed India to open up its tightly regulated retail and banking markets. "With Prime Minister Cameron's visit, we have set in place a new momentum to drive our strategic partnership forward," said Singh, who endorsed the vision of a "renewed and enhanced partnership". 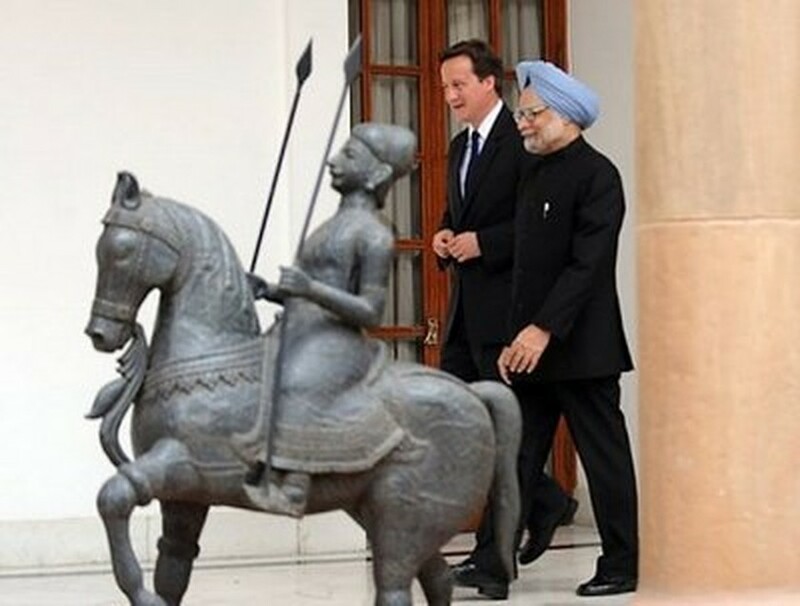 Cameron headed the largest British delegation to travel to India in recent memory, including a host of senior cabinet ministers and corporate bigwigs. In the only major commercial deal signed of note, BAE Systems finalised the sale of 57 Hawk trainer jets to India -- to be built locally under licence -- in a deal worth 500 million pounds (779 million dollars). Rolls-Royce will provide the engines for the aircraft for another 200 million pounds. In further comments designed to please his hosts, Cameron said he would continue to lobby for India to take a place on the UN Security Council and said Britain would push for the completion of a long-delayed EU-India trade deal this year. The prime minister has come under fire back home after writing that he came to India "with humility" and accepted Britain was just one nation out of the "the whole world beating a path to (India's) door."